Pinot Grigio is the blue jeans of the wine world – simple but good. A feel good, and comfortable wine. Background stuff is not something that excites, or strokes the ego of most winemakers but some here in Ontario are willing to oblige. And impress. Pelee Island has been producing very gulpable Pinot Grigio for as long as I remember and the 08 vintage may be their best ever. Fresh, fruity and a best buddy from the first sip. Summer patio stock for sure. 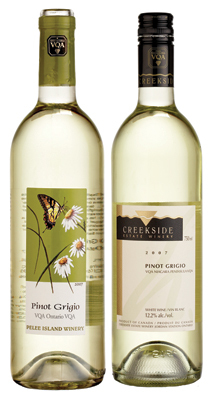 Creekside in Niagara produces a drier edition that will hit the spot on hot days. Handy screwcap. P.S. In wine country look for Pinot Gris (same as Grigio) at the following wineries: MALIVOIRE 08 Pinot Gris, Niagara ($18.95) is the designer jeans of Gris – crisp for refreshment and delicious for sipping. Stylish new packaging. Perfect hostess gift. HUFF ESTATE in Prince Edward County have elevated Pinot Grigio ($18.95) to something classy. Bright, jazzy and brimming with confidence. Shades of house wine at a fancy French restaurant. Another good County Gris is The GRANGE ‘Trumpour’s Mill’ 07 ($14.95). Lovely fruity, spicy flavours.